This article presents a real-world case report of akathisia and discusses emerging evidence-based treatment strategies for it. Mr. R. is a 65-year-old man with a history of posttraumatic stress disorder, alcohol use disorder (in remission), peptic ulcer disease (status post total gastrectomy), hepatitis C, and unspecified cognitive disorder. He was brought in by family members for bizarre behavior and increasing anxiety over the past several days. He wanted to attend a family reunion but instead presented to the hospital with the chief complaint of restlessness. He reported depressed mood, ongoing for several months, as well as hopelessness, anhedonia, and impaired sleep, most of which appeared to coincide with the onset of restlessness. Anxiety appeared to last 1 to 2 hours, with an accompanying sensation of chest tightness and shortness of breath. He experienced these symptoms many times per day and has had them intermittently for several years. Mr. R. denied symptoms of manic episodes or psychotic symptoms but made vague, passive suicidal statements of “not wanting to live like this anymore.” Throughout the initial interview, he appeared restless—standing up and sitting down, pacing, and asking to go outside to smoke. He began taking olanzapine during an admission 2.5 years prior for irritability and verbally abusive behavior but had no history of psychotic symptoms. He had been prescribed trihexyphenidyl and hydroxyzine for his restlessness and anxiety, as well as gabapentin for neuropathy and anxiety relief. A head computed tomography was performed and showed mild, diffuse atrophy and ventricular dilatation but no acute intracranial processes. Neurological examination was benign and negative for cerebellar signs that may have been related to prior alcohol use. He was initially admitted with a provisional diagnosis of anxiety disorder, major depression, posttraumatic stress disorder, and a cognitive disorder, possibly secondary to gabapentin use. Throughout his 1-month admission, Mr. R. continued to complain of restlessness. He had difficulty remembering the names of his recent residences. During multiple interviews, he became too restless to sit and had to terminate the interviews early. Akathisia or catatonic-like agitation was part of the initial differential diagnosis. A St. Louis University School of Medicine mental status examination was performed, and Mr. R. received a maximum score of 16 of 30 points. He denied perceptual disturbances or concrete reasons for anxiety and restlessness. A Barnes Akathisia-Rating Scale was administered and indicated severe akathisia. At this point, the diagnostic impression was changed to major neurocognitive disorder (formerly “dementia”) and akathisia as his key problems. Gabapentin was discontinued early in treatment, but his cognitive abilities remained impaired. He initially began taking low-dose diazepam 10 mg nightly at bedtime to treat neuroleptic-induced akathisia or possible catatonia, but he did not respond to this therapy. Based on a literature review, propranolol 20 mg twice per day (BID), ropinirole 0.25 mg BID, and vitamin B6 300 mg BID were prescribed. All medications were given via oral administration. Mr. R. remained restless, became agitated, and starting yelling while on the unit. At this time, olanzapine 10 mg was added back to his regimen as a nightly dose because akathisia may have also been attributable to antipsychotic withdrawal. However, behavioral problems continued and this medication was changed to haloperidol liquid 10 mg three times per day (TID), supplemented with chlorpromrazine 50 mg for breakthrough agitation. The need for higher doses of medications reflects his status post total gastrectomy. Propranolol and ropinirole were discontinued due to a lack of effect and trihexyphenidyl 1 mg TID was restarted. With this combination of medications (haloperidol, chlorpromazine, trihexyphenidyl, vitamin B6), his akathisia, anxiety, and mood symptoms improved considerably. He was able to sit still for longer than 5 minutes, representing a significant reduction of target symptoms attributable to drug-withdrawal akathisia. He was then discharged to a subacute care facility. As a result, several rating scales and criteria have been developed to identify akathisia. The Diagnostic and Statistical Manual of Mental Disorders provides a guideline for identifying akathisia but does not provide a quantifiable assessment.9 The most commonly used, reliable, and validated scale is the Barnes Akathisia-Rating Scale, first published in the British Journal of Psychiatry in 1989.10 By quantifying both objective and subjective components, the scale gives a measure of akathisia severity. It includes objective findings, subjective awareness of restlessness, subjective distress, and a global clinical assessment of akathisia.2,10 Although some clinicians may forego scales in favor of clinical observation, akathisia can be confused in the clinical setting with other disorders, such as agitation related to mood or psychotic disorders, restless legs syndrome, anxiety states, drug-withdrawal states, antipsychotic dysphoria, organic medical/neurological disorders, or tardive dyskinesia.2–4,6 As such, a rating scale may be useful in diagnosis and early treatment. However, treatment strategies that include benzodiazepines, beta-adrenergic blockers, and serotonin antagonists suggest that a more complicated relationship exists between multiple neurotransmitter systems, including dopamine, acetylcholine, gamma-aminobutyric acid (GABA), norepinephrine, serotonin, and neuropeptides.2,5 Involvement of multiple neurotransmitter systems is further supported by the fact that drugs such as clozapine and quetiapine, which tend to weakly bind with dopamine receptors (and more potently with serotonin receptors), may cause akathisia in the absence of other extrapyramidal effects. Finally, the currently understood mechanism of extrapyramidal symptoms (EPS) suggests that dopamine antagonism results in changes to the two pathways emanating from the basal ganglia—affecting the direct pathway results in dyskinetic movements and affecting the indirect pathway results in symptoms of Parkinson’s disease. Because this model does not indicate or explain a clear pathway for the development of akathisia,5 it suggests that the picture is more complicated than dopamine’s effects alone. Regarding medications, a common first step is lowering the antipsychotic dose, switching to low-potency antipsychotic agents (eg, chlorpromazine, thioridazine), or switching to an atypical agent. However, a conservative approach should be used when changing doses, cross-tapering, or switching medications due to adverse effects, such as precipitation of psychotic relapses or withdrawal akathisia.2 Several pharmacological interventions are seen as first-line therapy for the treatment of akathisia. Beta-adrenergic antagonists, clonidine, benzodiazepines, and anticholinergics are most supported in the literature and are discussed below. New treatment strategies tend to belie previous suppositions about akathisia’s pathophysiology from purely dopaminergic roots. Most new data are supportive of serotonin’s role. However, other treatment strategies are also being explored, such as the use of vitamin B6 and drugs that affect dopamine or GABA directly. Future directions of serotonin’s role include the study of other receptors that may have therapeutic effects. Zolmitriptan works on the 5-HT1d receptor and, in a 33-patient, double-blind study,26 was shown to be as beneficial as propranolol. Due to this common potential mechanism, medications for RLS that work on the same neurotransmitters have been hypothesized to work for akathisia. Amantadine has been used for several years as an anti-Parkinson’s agent and a last-course alternative in treating akathisia.2,15 As a weak antagonist of the glutamate receptor, it both increases dopamine release and works as a dopamine reuptake inhibitor.5 It is typically prescribed at a dose of 100 mg/day.1 Similarly, ropinirole is a potent dopamine agonist that works at the D2, D3, and D4 receptors.12 Its use in Parkinson’s disease and RLS is well-documented,12 but a lack of substantial evidence exists for its use in akathisia. One case study found that aripiprazole-induced tardive akathisia responded to treatment with ropinirole.12 Unfortunately, the use of dopamine-increasing medications is limited by side effect profiles, such as psychosis and impulsivity, which may be the target symptoms being treated by neuroleptics in the first place. Effects on GABA have also been implicated in development of akathisia.5,14 Many antipsychotic medications cause an inhibition of GABA receptors via dopamine antagonism. This mechanism may underlie side effects like akathisia, RLS, and lowering of the seizure threshold.30 Further support for GABA’s role is seen in the long-standing use of benzodiazepines as a treatment regimen for akathisia. Medications that increase levels of GABA (eg, pregabalin) have been shown in double-blind, placebo-controlled studies to effectively control RLS symptoms.31 One case study found that relatively high doses of gabapentin (3000 mg/day) helped effectively treat a patient with neuroleptic-induced akathisia.32 Another case study found that the addition of pregabalin (150 mg/day) to a regimen of aripiprazole helped reduce tardive akathisia.13 Although further research is warranted, drugs that affect GABA may be a new avenue for treatment when other therapies have failed. Akathisia remains an ongoing problem, despite the greater use of second-generation antipsychotics. The exact mechanism of development remains poorly understood, although ongoing research points to a greater involvement of other neurotransmitter systems outside of dopamine, such as acetylcholine, serotonin, and GABA. From this new theoretical foundation, treatment strategies have moved beyond longstanding regimens (eg, beta-blockers, anticholinergics, benzodiazepines) by including serotonin-based pharmacotherapy (eg, mirtazapine, mianserin). Based on akathisia’s similarity to movement disorders such as RLS, new approaches under investigation include medications that increase dopamine and GABA (eg, ropinirole, gabapentin, pregabalin, vitamin B6), which are depleted with neuroleptic use. Timely diagnosis and adequate treatment are key in maintaining patient rapport, improving medication compliance, and increasing efficacy. Thus, providers need to be aware of this phenomenon and understand how to manage it effectively using the latest research-supported treatment regimens (Table 1). Kane JM, Fleischhacker WW, Hansen L, et al. 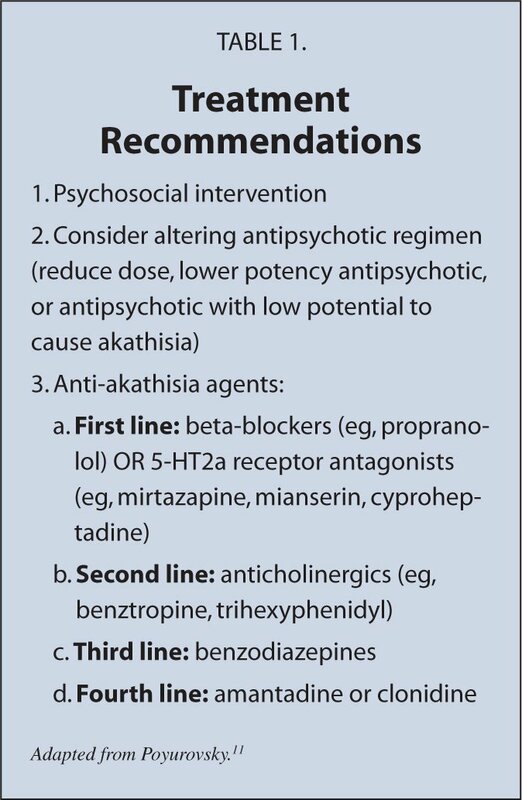 Akathisia: an updated review focusing on second-generation antipsychotics. J Clin Psychiatry. 2009; 70(5):627–643. doi:10.4088/JCP.08r04210 [CrossRef]. Iqbal N, Lambert T, Masand P. Akathisia: problem of history or concern of today. CNS Spectr. 2007;12(9 Suppl 14):1–13. Stryjer R, Rosenzcwaig S, Bar F, Ulman AM, Weizman A, Spivak B. Trazodone for the treatment of neuroleptic-induced acute akathisia: a placebo-controlled, double-blind, crossover study. Clin Neuropharmacol. 2010;33(5):219–222. doi:10.1097/WNF.0b013e3181ee7f63 [CrossRef]. Kane JM, Barnes TR, Correll CU, et al. Evaluation of akathisia in patients with schizophrenia, schizoaffective disorder, or bipolar I disorder: a post hoc analysis of pooled data from short- and long-term aripiprazole trials. J Psychopharmacol. 2010;24(7):1019–1029. doi:10.1177/0269881109348157 [CrossRef]. Poyurovsky M. Acute antipsychotic-induced akathisia revisited. Br J Psychiatry. 2010;196(2):89–91. doi:10.1192/bjp. bp.109.070540 [CrossRef]. De Berardis D, Serroni N, Moschetta FS, Martinotti G, Di Giannantonio M. Reversal of aripiprazole-induced tardive akathisia by addition of pregabalin. J Neuropsychiatry Clin Neurosci. 2013;25(2):E9–E10. doi:10.1176/appi.neuropsych.12030069 [CrossRef]. Kramer MS, Gorkin R, DiJohnson C. Treatment of neuroleptic-induced akathisia with propranolol: a controlled replication study. Hillside J Clin Psychiatry. 1989;11(2):107–119. Lima AR, Weiser KV, Bacaltchuk J, Barnes TR. Anticholinergics for neuroleptic-induced acute akathisia. Cochrane Database Syst Rev. 2004;(1):CD003727. Miller CH, Fleischhacker WW, Ehrmann H, Kane JM. Treatment of neuroleptic induced akathisia with the 5-HT2 antagonist ritanserin. Psychopharmacol Bull. 1990;26(3):373–376. Avital A, Gross-Isseroff R, Stryjer R, Hermesh H, Weizman A, Shiloh R. Zolmitriptan compared to propranolol in the treatment of acute neuroleptic-induced akathisia: a comparative double-blind study. Eur Neuropsychopharmacol. 2009;19(7):476–482. doi:10.1016/j.euroneuro.2009.02.006 [CrossRef]. Winkelman JW. Considering the causes of RLS. Eur J Neurol. 2006;13(Suppl 3):8–14. Jhoo JH, Yoon IY, Kim YK. Availability of brain serotonin transporters in patients with restless legs syndrome. Neurology. 2010;74(6):513–518. doi:10.1212/WNL.0b013e3181cef824 [CrossRef]. Karthik Sethuram, DO, is a PGY-3 resident, UCSF-Fresno Psychiatry Residency Training Program. Joanna S. Gedzior, MD, is Staff Psychiatrist, VA Central CA Health Care System and an Assistant Clinical Professor, Health Sciences, UCSF-Fresno. Address correspondence to Karthik Sethuram, DO, UCSF-Fresno Department of Psychiatry, 155 N. Fresno Street, Suite 338, Fresno CA, 93701; email: ksethuram@fresno.ucsf.edu.